Carbon dioxide gas is widely used for fire extinguishment. At elevated pressures, the gas can be liquefied and kept in a pressure vessel at its saturated vapor pressure, which at 20 °C is 5.6 MPa. This is the most convenient way to store large quantities of carbon dioxide at ambient temperatures. At atmospheric pressure, carbon dioxide can only exist as a gas, or if cooled to about -80 °C, as dry ice, its solid form. When liquid CO₂ is released from a storage pressure vessel, the carbon dioxide undergoes a change of phase from liquid to a mixture of gas and solid. The sliding action between particles of dry ice and nearby objects can generate static electricity. A portable CO₂ extinguisher is useful against fires involving electrical equipment. To avoid the risk of operator electrocution, the extinguisher’s directional horn is made of a non-conductive material. The sliding action of solid CO₂ in the horn can produce electrostatic potentials of 20–30 kV within a few seconds. Experienced firefighters know this can result in an unpleasant but harmless electrostatic shock. What is less known is that the electrostatic discharges have sufficient energy to ignite flammable vapors, if present. A disastrous explosion took place in a JP-4 aviation fuel underground tank at a US Air Force fuel depot near Bitburg, Germany, in 1954, killing 37 people. The newly constructed tank was equipped with a carbon dioxide fire extinguishing system, the first of its kind in Germany. The tank was 20 percent full when various acceptance tests were carried out. Present were the senior engineering staff of the French Mission des Grands Travaux Aéronautiques and other German and French officials, technicians and contractors. The members of this party were standing on the top of the tank when the explosion took place. The supply house with CO₂ cylinders was located about 75 m from the tank and connected to the tank by a buried steel pipeline. At the top of the tank, a technician made a controlled activation of the tank’s novel fire extinguishing system. Approximately one minute later, a violent explosion disintegrated the tank. In the past decade, there has been a major increase in the consumption of wood pellets. The growth has been mirrored in an increase of pellet-related accidents involving fires, dust explosions, and toxic gases. Smoldering fires in wood pellet storages present major difficulties. The fires can occur for a number of reasons. Pellets can self-heat deep inside a pile, mechanical friction can ignite dust particles, and embers can travel in the conveyor system and start fires in storage areas. Water cannot be used for firefighting. It is extremely difficult to apply water to a hot spot located somewhere deep inside a large pile of material, in part because wetting and swelling of wood pellets can produce forces that break the silo walls. Alternative firefighting strategies have been devised which use an injection of an inert gas. The gas can deplete the oxygen available for combustion and quench the fire. Carbon dioxide offers several technical advantages, as it is denser than air and is commonly available in large quantities. The problem is that oxygen-deficient smoldering fires can produce large quantities of flammable pyrolysis gases, primarily carbon monoxide. If liquid CO₂ is released into a confinement where pyrolysis gases are in the ignitable range, static discharges may lead to a silo explosion. 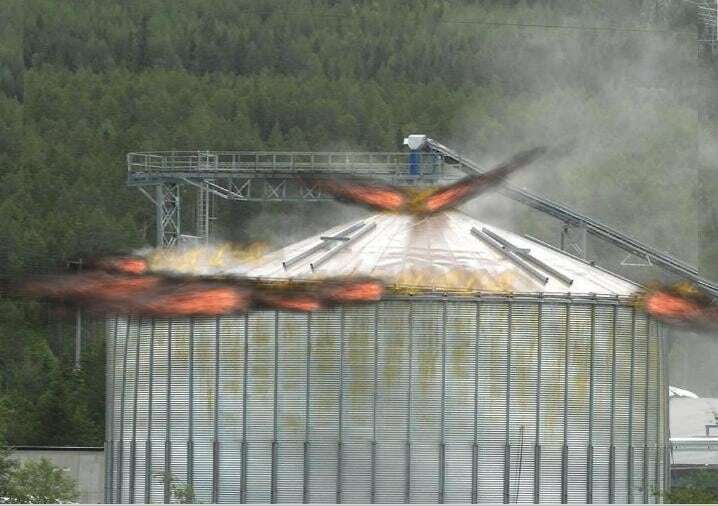 In Norway 2010, firefighters were called to a smoldering fire in a wood pellet silo. They were quick to order a shipment of nitrogen, but it would arrive only after 14+ hours. Elephants can learn to do a headstand, but they can’t jump. Firefighters can’t wait idly for so long for supplies of nitrogen to arrive. They are men of action. In an attempt to retard the fire, they released CO₂ cylinders into the silo. The silo exploded. The electrostatic hazard of liquid carbon dioxide is widely under-appreciated in wood pellet handbooks, NFPA standards, guidelines and other literature. In the past, major explosions have been attributed to electrostatic ignition of flammable vapors during the release of CO₂ for fire prevention purposes. There is evidence to suggest that those early lessons learned have at least partly passed out of sight. 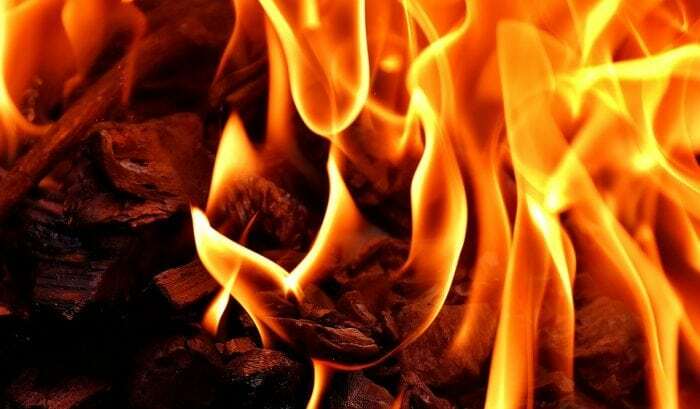 The application of carbon dioxide is excellent for extinguishing a fire with flames but unsuitable for quenching a deep-seated smoldering fire without flame. Carbon dioxide should never be released into a confinement where flammable vapors are present in a misguided attempt to make the atmosphere “safe”. These findings are described in the article entitled Carbon dioxide not suitable for extinguishment of smouldering silo fires: static electricity may cause silo explosion, recently published in the journal Biomass and Bioenergy. This work was conducted by Frank Huess Hedlund from COWI and DTU (Denmark). Frank is a risk expert at COWI.